Looks like humans aren’t the only animals working off the holidays. On February 18, this little Eastern Screech Owl was found in the parking lot of Bally’s Total Fitness on Staten Island. The initial exam at The Wild Bird Fund revealed that the screech owl could perch, walk and fly well, but she seemed to be suffering from a concussion. In short, she “had her bell rung”. We encountered an interesting situation while examining Ms. Screech: the owl kept falling asleep as soon as we stopped examining her. Because screech owls are nocturnal and sleep very deeply during the day, this behavior is normal. 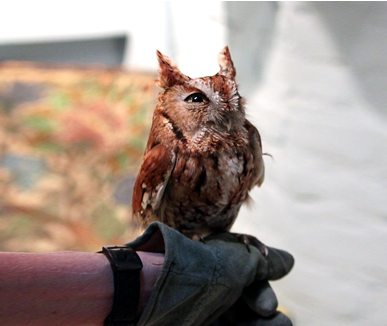 Volunteers Beverly and Cesar took the screech owl to The Raptor Trust for continued observation on February 20. The Raptor Trust has reported that Ms. Screech is doing well and is quite the escape artist. She has managed to escape from her cage and close the door behind her. Ms. Screech will be transferred to an outdoor flight cage in a few days. We hope to be able to return her to Staten Island shortly.